I’m a van camper. Mine is not one of those elaborate camper vans with a lot of built-ins. It has a lot of throw-ins. But my dogs and I have had all manner of fun on one- and two-nighter camping trips, mostly to the mountains or the coast. On one trip to the mountains, the weather was hot. Sultry. Downright suffocating, even in the shade. Behind my campsite was dense bush and tall trees. Surely it would be cooler back in there. I just hoped all the animal residents were snoozing through the heat of the day. Taking my dachshund on her leash, I stepped gently into the shadows. Yes, the further we went into the dark shade, the cooler it felt. A moist, earthy smell surrounded us. It was as if we had traveled miles north, to a cooler, earlier time. Grass did not grow here. Limbs and small trees had been felled by lack of light. Clear brown earth stretched across under the darkening shade. And back where the shadow was nearly black, back against the thickest undergrowth, tiny white flowers hung majestically on white stems jutting up about six inches from the dark earth, winking against the darkness, yielding to the moving shadows. Indian Pipe! Ooooh! 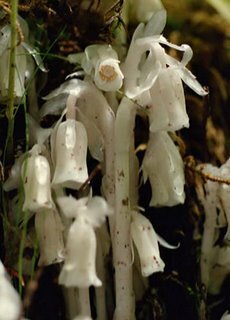 Indian Pipe! Without the blast-furnace of deep-summer heat, I would never have intruded so far off the beaten path and found those little chalk-white flowers. I wasn’t happy with that uncomfortable heat, but I was more than happy with my find. Wise lady. Right. There’s always something special about discovery. I grew up in a Lutheran church and attended the Lutheran church through my college years. So, the name of Dietrich Bonhoeffer, a German Lutheran pastor and theologian, is and always has been familiar to me. He was introduced as a theologian, scholar, anti-Nazi conspirator and martyr, a tragic martyr, because he was hanged in the concentration camp at Flossenbürg on April 9, 1945, just short of a month before the end of World War II in Europe (May 8, 1945). I have read three of his books: Life Together, The Cost of Discipleship and Letters and Papers from Prison. Nobody had told me then what I learned today, that he was engaged just before his arrest by the Nazis. His fiancé was Maria von Wedermeyer (born April 23, 1924, died November 16, 1977.). To share more deeply of his imprisonment, she marked out with chalk an enclosure the size of his cell on her bedroom floor, so that she could write to him as though she were with him. In his final letter to her, Bonhoeffer wrote, "I have often found that the quieter my surroundings, the more vividly I sense my connection with you." He was executed a few months later. Bonhoeffer’s correspondence with her has been published as Love Letters from Cell 92. The story of Maria’s death has a poignant twist to it. When Joseph and Mary Lou Bayley’s son was killed in a sledding accident, his fiancé sent them a poem written by Dietrich Bonhoeffer for New Year’s Day, 1945. Joseph included the poem in his book, Heaven. Years later, Joseph got a letter from a pastor-friend in Massachusettes, telling that some years before, he had been visiting a terminally ill woman in a Boston hospital. He brought her a copy of Bayley’s book. The woman stayed up that night reading it. The next day, when the pastor visited, the woman told him how much the book had helped her. A few hours later she died. The woman was Maria von Wedermeyer Weller, Bonhoeffer’s fiancé of 30 years earlier. 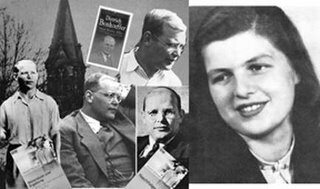 I have ordered Love Letters from Cell 92: The Correspondence Between Dietrich Bonhoeffer and Maria Von Wedemeyer, 1943-45 by Ruth-Alice Von Bismarck (Maria’s sister), Ulrich Itz, Ulrich Kabitz (Editor) and the DVD of Bonhoeffer (2003) starring Eberhard Bethge, Klaus Maria Brandauer Director: Martin Doblmeier. I’d like to get to know this icon, this stylized giant, as a man of and among common people. 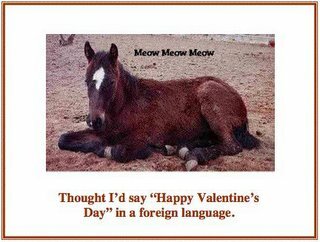 And I’d like to “meet” Maria. Over the past couple of years I've stopped liking sausage. It's too greasy and too strong in the seasonings. I tried vegetarian and didn't like that. So, I've been looking around and finally found a recipe for making sausage myself. The first time I made it (following the recipe to all jots and tittles), there was one spice that seemed to me to be poking its elbows out -- too strong and not blending in with the other spices. A couple days ago I did a little revising of the recipe before cooking up a new batch, and Wow! Now I can make a gentle but tasty sausage. Now I can taste all the flavors. I really like it a lot! As you might guess, the apple and maple add so much! Preheat a medium skillet over medium-high heat with 1 tablespoon oil and 1 tablespoon butter. Mix chicken with apple, syrup, grill seasoning, poultry seasoning, cinnamon and nutmeg and score the meat into 8 to 10 sections. 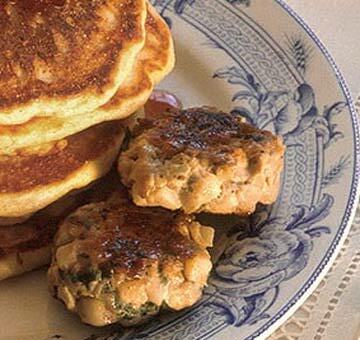 Form thin, round patties and set into hot butter and oil. Cook 3 to 5 minutes on each side. Set on paper towel to drain excess grease. You can substitute unsweetened applesauce for the fresh apples. I made 2 pounds, used 3 McIntosh apples and an extra 1/2 c. maple syrup, since turkey is so dry. Good stuff, but I like the chicken better. I make the big Grands Biscuits to go with my sausage. So, to size my sausage patties for the biscuits, I use an ice cream scoop to plop the soggy sausage mixture into the frying pan. Now that the flavors are nicely balanced, I’m surprised how much the combination of tastes is similar to the blending of sounds of an orchestra or a choir. One strident voice can unbalance all the others. I have a feeling that there’s a deep, rich truth here: that any one overplayed factor – of anything -- can unbalance the whole – whatever. Any time. Anywhere. I bet we do that a lot.